I mentioned to one of my blog posts that sometimes, I let my skin rest from strong whitening soaps because my skin is naturally super dry. Whenever I'm using whitening soap for straight couple of months, I would get rashes and flaky skin. With that being said, a lotion is my staple product to combat my skin's dryness. 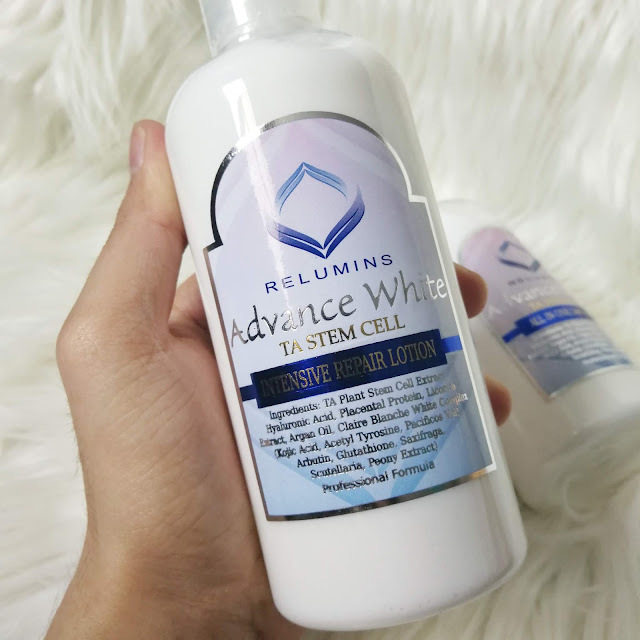 I recently tried the Relumins Advance White Stem Cell Therapy All in One Day Lotion and Relumins Advance White Stem Cell Therapy Intensive Repair Lotion. They are two different lotions intended for day and night use. Flawless Beauty and Skin "Click here"
You can also like them on Facebook by "Clicking here"
During daytime, I use the Relumins TA Stem Cell Therapy Advance All in One Day Lotion. The active ingredients are cradled in a light lotion base designed to hydrate and be absorbed deep into the skin where they can do the most to stimulate healthy skin repair, breakdown dark pigments and prevent new pigment formation. This lotion has the ability to protect our skin from harmful rays of the sun and pollution. And that's honestly a big factor for me because I go out a lot and I don't want the sun and pollution to take away my youthful glow and give me sun spots and wrinkles. That's why the use of this kind of lotion with sun protection is my number one priority. The lotion is kinda heavy after application but it disappears after few minutes. 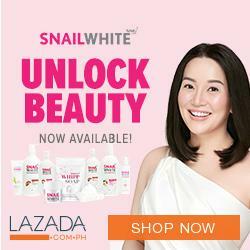 So I suggest to put the lotion 30 minutes before going out to make sure that your skin is protected and to enjoy that weightless feeling under the humid weather here in the Philippines. 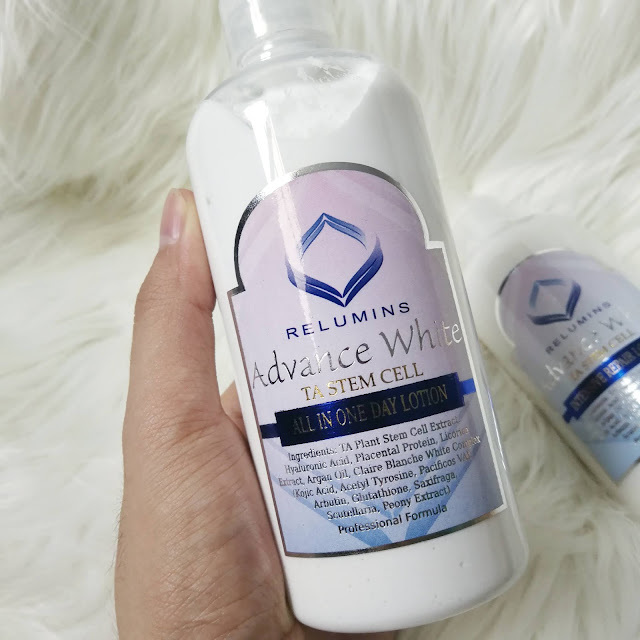 Before going to bed I use the Relumins Advance White Stem Cell Therapy Intensive Repair Lotion. It has a blend of TA-Plant stem cell, placenta proteins, and Hyaluronic acid- to deeply hydrate and rejuvenate the skin. I must commend this lotion because of its relaxing scent that makes me wanna sleep early and not play around my Instagram feed till midnight hahaha. I also love how lightweight it is because I hate going to bed with sticky feel on my skin. Both lotions have amazing packaging. 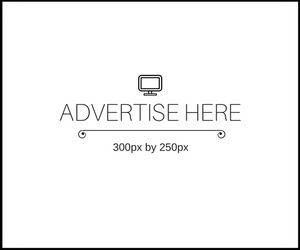 They are so detailed so everything you need to know about the product is clearly printed on their labels. I also like their pumps because that makes it easier for me to dispense the product hygienically. An added bonus to these amazing lotions is the Relumins Advance Whitening Soap With Intensive Skin Repair & Stem Cell Therapy. This soap complements well with the lotions because it contains almost the same ingredients aiming to give the skin a healthy, glowing, ageless, and flawless skin. 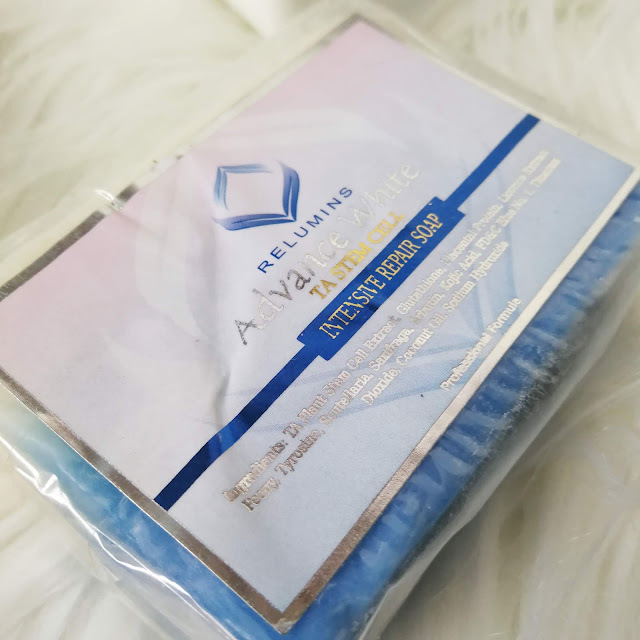 Unlike any other whitening soaps that I've tried, this soap is not harsh but it's working very well in making the skin lighter. I also like its moisturizing effect every after use. 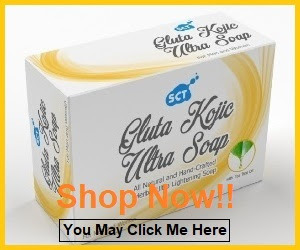 This soap is a must have if you have sensitive and dry skin. All in all, I enjoyed using the Relumins TA Stem Cell Therapy Advance Body Whitening Trio. I like the glow it gives on my skin and I feel protected day and night whenever I'm using this trio. 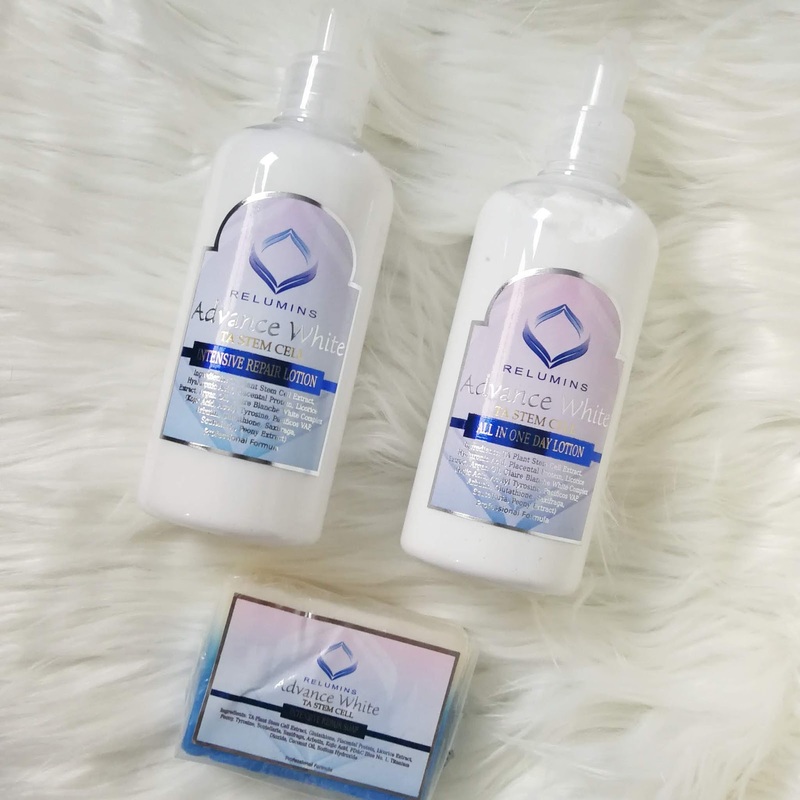 If you are looking for an amazing whitening body lotion and soap that you can use as maintenance, I highly recommend this awesome trio. Not only it can reverse skin aging and repair damage skin, it is also effective in making the skin flawlessly beautiful.